It was a mixed week for US equity indexes, with net weekly changes ranging from +0.2% (Transports), -0.3% (sp'500, Dow, Nasdaq comp', NYSE comp'), to -1.5% (R2K). Near term outlook offers renewed strength above the giant psy' level of Dow 20k, along with the sp'2300s. 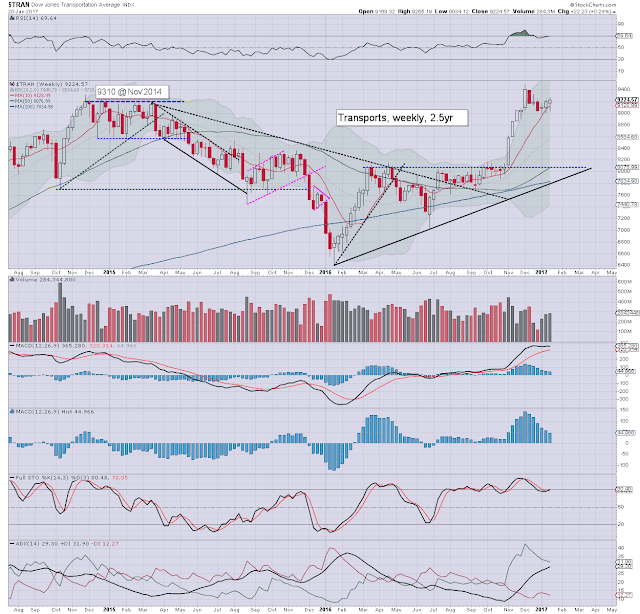 A net weekly decline of -3pts (0.15%), settling opex @ 2271... just 11pts shy of recent historic highs. Underlying MACD (blue bar histogram) cycle continues to slowly tick lower. At the current rate, there won't be a bearish cross for at least another 2-3 weeks. Best guess: upside to the 2320/30s... before a basic correction of 5% to the low 2200s. Any price action in the 2100s looks out of range. 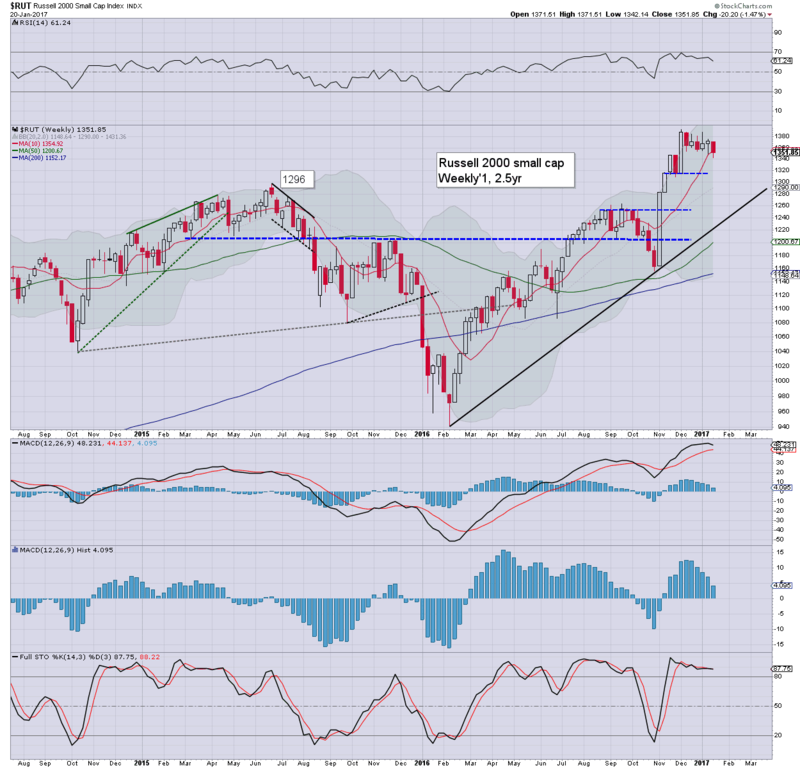 More broadly... the 2400s look viable by May/June. A minor net weekly decline of -0.3%, settling @ 5555. Upper bollinger will likely be in the 5700s in February. The 6000s look out of range until at least April/May. A net weekly decline of -0.3%, settling at 19827. A renewed push higher looks due, and its notable the mighty Dow is only -0.9% below the giant psy' level of 20k. Upper bollinger is offering the 20500s into early Feb', which would equate to the sp'2320/30s. The master index settled -0.3% @ 11192. 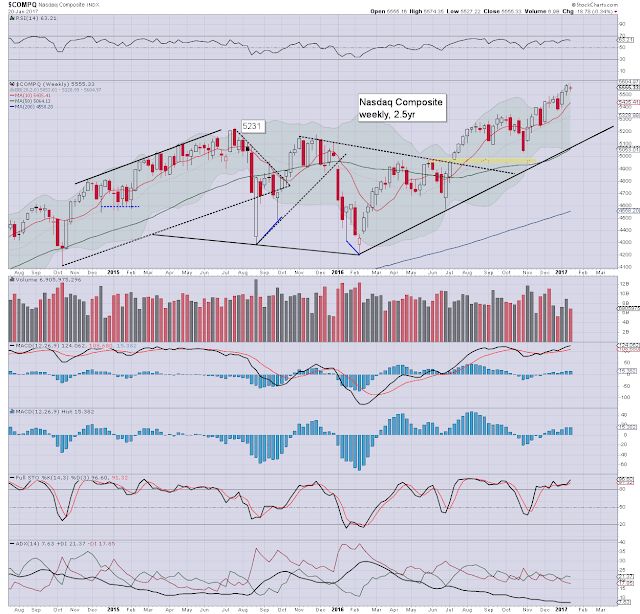 New historic highs >11264 look due into February. 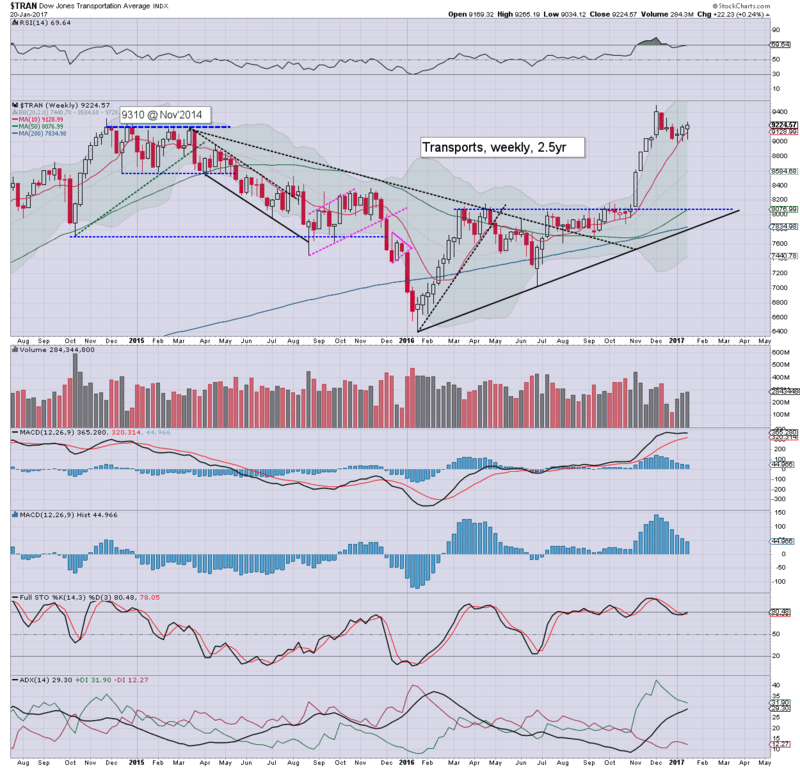 The 12000s look a valid target for late spring. 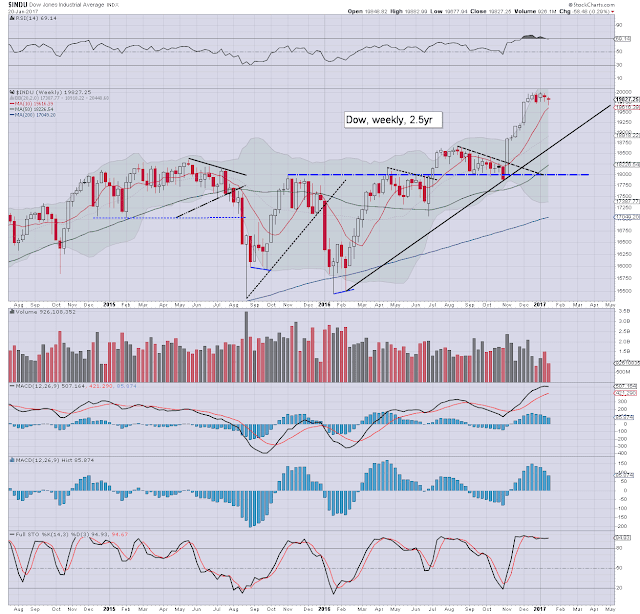 The second market leader - R2K, was the laggard this week, settling lower by a rather significant -20pts (1.5%) at 1351. The 1425/50 zone appears a viable target in about 3 weeks. Underlying MACD is vulnerable to a bearish cross within 1-2 weeks, but instead... a divergent lower high (relative to mid Dec') looks due to occur by mid February. 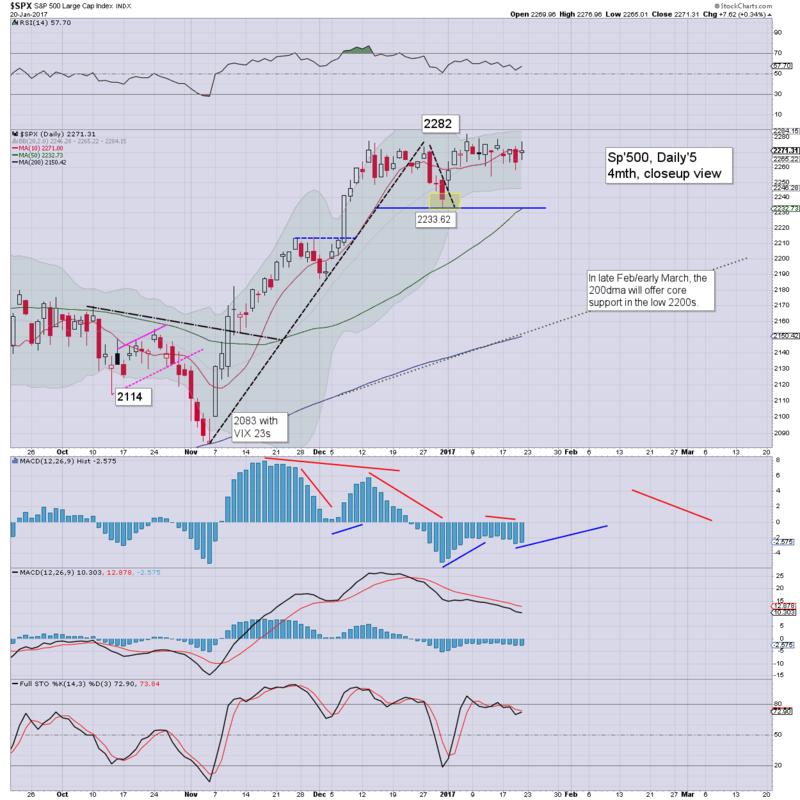 The 'old leader' - Trans, was the one positive index/sector this week, managing a minor gain of 0.2%, settling at 9224. 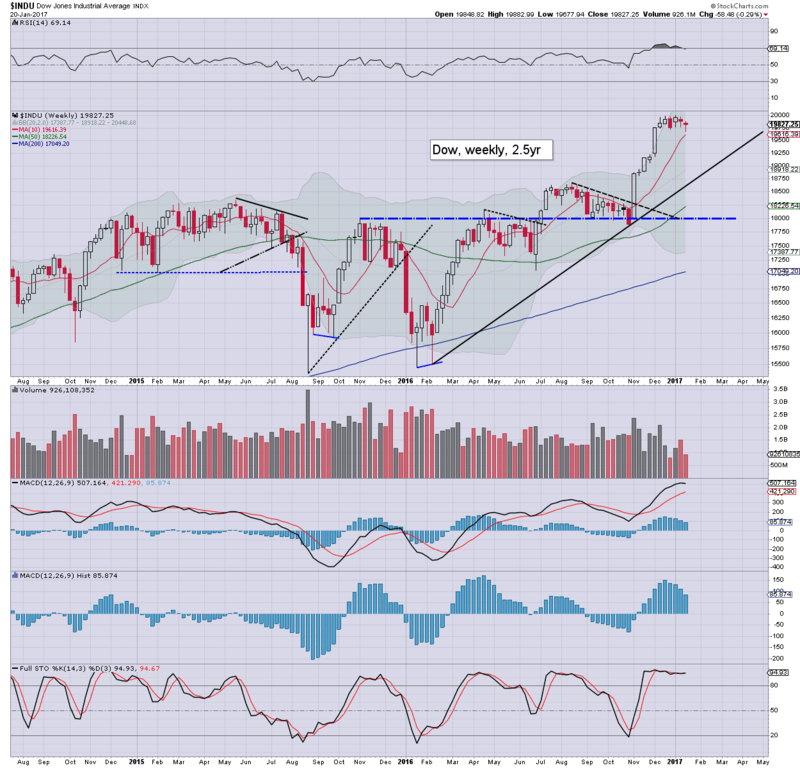 Most US indexes have been in moderate chop mode for around six weeks. Price structure in most indexes is arguably a bull flag/pennant. Further upside of 2-3% looks probable by mid February. 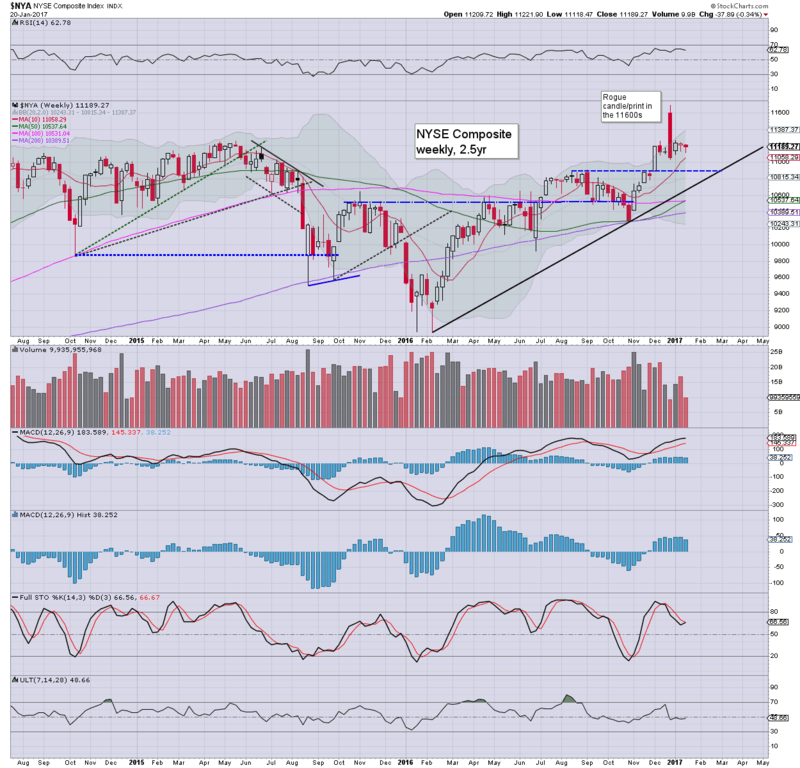 From there... a distinct threat of a 5% correction, back to the low 2200s. That would make sense as broadly, the market hasn't seen any significant retrace since the hyper ramp from the early Nov' low of sp'2083. Equity bears have nothing to tout unless we're trading back under the monthly 10MA, and in February, that will be around sp'2200. If you value my posts... then subscribe to me. US equity indexes closed moderately higher, sp +7pts @ 2271. The two leaders - Trans/R2K, settled higher by 0.7% and 0.5% respectively. VIX settled -9.7% @ 11.54. 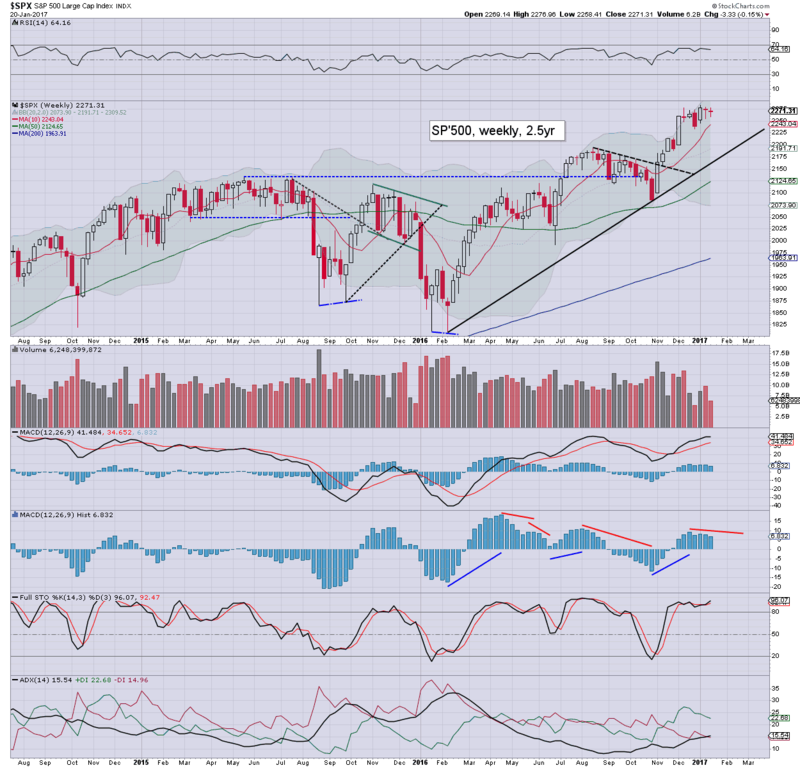 Near term outlook offers broad upside across the next 2-3 weeks.. which should equate to Dow >20K and sp'2300s. ... and the Trump era has begun. Naturally, as it was opex - along with the inauguration, price action was just moderate chop.. but clearly leaning to the upside. 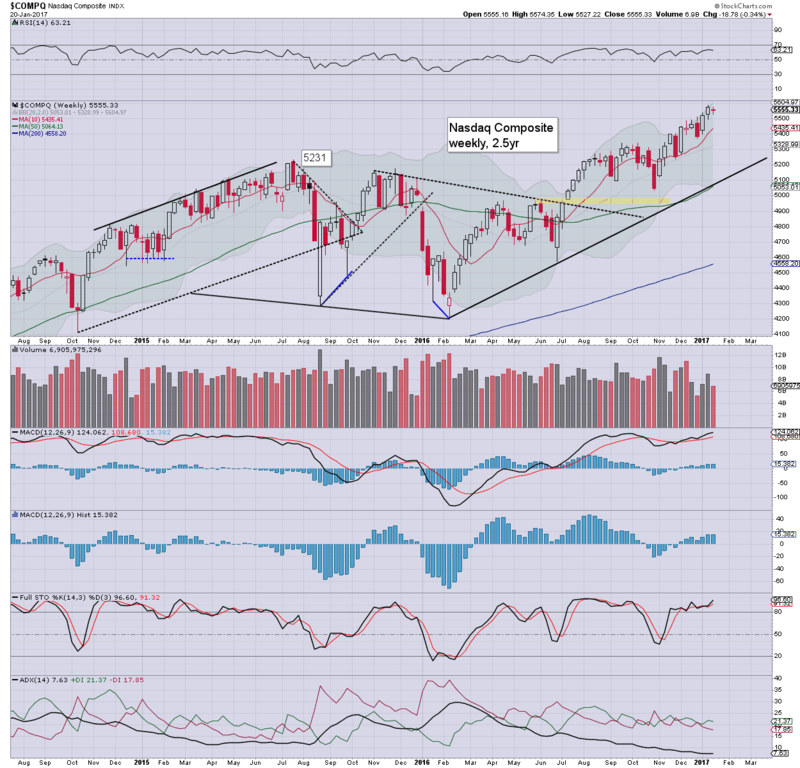 New historic highs >2282 look probable next week... along with Dow 20k. Its notable that even without Dow 20k, the VIX is back in the 11s again. 10s look due next week. 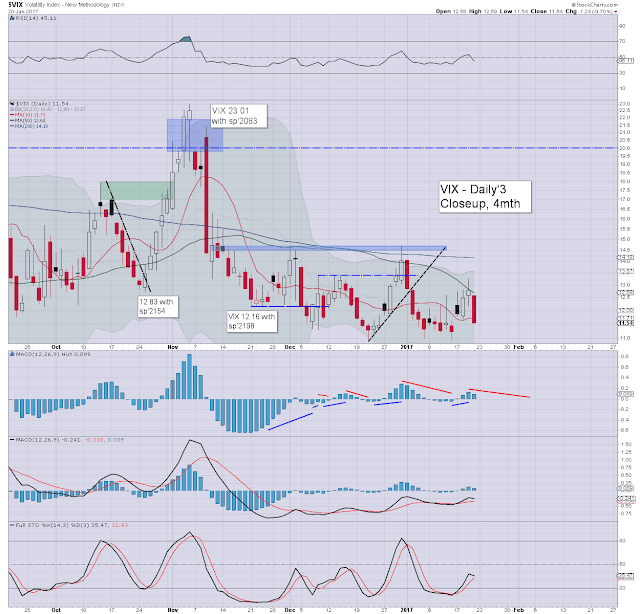 A curious thought it whether we might finally single digit VIX.... last seen Feb'2007. In any case... whatever you think of Trump.. a new era has begun.